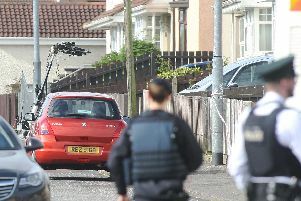 Police are appealing for information about the attempted robbery of a fast food delivery driver in Londonderry. Constable Moody, the investigating officer, said the man was delivering pizza in Virginia Court on Saturday, January 16, at about 7.30pm. “He parked his vehicle up next to an alleyway and proceeded on foot to the delivery address. As he was returning to his car he noticed two males running down the alleyway towards the Trench Road. “When he reached his car and got into it, a brick was then thrown through the driver’s side window. Both males then started to shout at the victim ‘gimme your money’. Both were holding three feet long metal bars. “The delivery man managed to drive off and no money was taken. The would-be robbers were aged in their late teens or early 20s and were wearing dark clothing. Anyone with information is asked to contact police in Strand Road on 101, or contact Crimestoppers anonymously on 0800 555 111.